The reverse side of the Synergy DVD cover of Monster a-Go-Go minces no words; “Is it a misunderstood masterpiece… or the WORST MOVIE EVER MADE?” Embracing the badness of a film doesn’t detract from the potential viewing experience in the least. Seriously, would you rather see another run of the mill movie you’ll forget as soon as you pop it out of the DVD player or would you want to witness legendary awfulness, the great stuff that sticks with you forever? Synergy’s banking on the latter and I don’t blame them. But is this Monster really a monster? Or is this just another bad movie to add to the shelf? Well, hell, let’s Go-Go and find out! Satellites not operated by earthly citizens have been discovered floating in space and an American astronaut has been sent to check things out. Upon re-entry to earth somewhere near Chicago, out of the capsule emerges a hideous beast, fuelled by radiation and out for the blood of any earthlings (”horribly mangled in a way no one had ever seen before”) in his path! Scientists and police come together in an attempt to track and stop the beast before it’s too late as the mutation grows bigger, stronger and…. well, not really any faster. As innocent victims fall to its prey, a fork in the road is revealed that is sure to shock and awe and leave you groaning for more! It seems for sure that humanity is doomed, and hell, so is the home viewer! 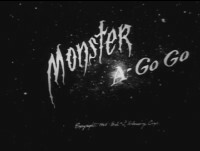 Monster A-Go-Go is definitely not the worst movie of all time, that dubious distinction is better served with many of the fan films shot on VHS and phone cameras on the half dozen Pendulum Pictures 50 Movie Packs released from Mill Creek. In a queer way, that is about the best compliment you could play this mish-mash of a sci-fi/horror hybrid, because it’s not too far back from the bottom of the well. Like many of the most horrible horrors out there, a-Go-Go is barely a real movie due to the fact that its creation stemmed from an unfinished feature that was purchased by goremeister Herschell Gordon Lewis when he needed a bottom bill for his feature, Moonshine Mountain. Lewis didn’t waste any time (or money) slapping the unfinished opus together to be serviceable, and I use that term loosely, for drive-in fodder. Where the hilarity Go-Gos is from the shoddy editing and incomprehensible story arc that bounces to and fro with people you barely recognize and names you can’t remember. The astronaut is referred to as Frank, but also is referred to as Douglas for the opening 20 or so minutes. I couldn’t figure out what was going on until later on it was revealed that his name was Frank Douglas and brain cells were finally able to connect and put it all together. This type of shoddy editing is the main reason to watch the movie since the acting isn’t as putrid as you’d expect. The humor extends from it being unfinished and tied together (like all these abandoned wonders) by narration, reportedly done by H.G.L. himself. I have no idea where overdubs and dialogue in general were recorded because half of the echoing audio sounds as though it was recorded inside a tin silo. The bullet proof creature looks all right, perfect for a movie such as this, and acts like a much taller and lanky Frankenstein’s Monster. 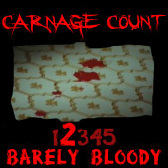 With that said, he doesn’t do much and the kills are tame and off screen. There’s some sixties swing, and the dancing and main song are entertaining, but the scientific radiation mumbo-jumbo and police work bog the fun down to badness. The best scene happens when a disgruntled slick-haired boyfriend sees a punk dancing with his old lady. Not taking kindly to this, the bonafide badass manages to take a huge puff of a cigarette, down four ounces of hard liquor without wincing, walks onto the dance floor and tosses the poor kid to the ground and takes off with the girl, all within 20 seconds. After this display of brute manliness, he takes his girl to lover’s lane where they encounter the monster and quickly off’d. Shades of perennial bad movie favorite Pieces can be witnessed when a victim is found burnt and prune-faced in a field, yet the police officer then deems a discovered burned area in said field to be the work of a kid’s prank! Synergy’s DVD is relatively clear, but the movie shows its age and cheapness with thin lines and a bit of softness, while the audio is loud and pretty clear, but the original source dooms it from the get-go. The cover art is great and retro, disc art first-rate featuring poster art, and at a price point of under $10, includes a commentary with Bill Rebane and historian, Joe Rubin, a Rebane interview, a couple shorts, trailer and a spectacular 24 page booklet which is a heck of a read. No, Monster A-Go-Go isn’t a monster piece of crud because truthfully the unfinished Bill Rebane project actually shows some potential. 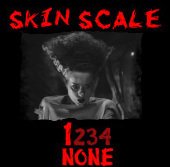 Had money not ran out, this review would probably have played out much differently, but in Herschell Gordon Lewis’ choppy hands, he cements this one into camp classic hell. And I’m sure he wouldn’t deny that. As a Synergy DVD package it’s worth checking out for us lovers of drive-in crap, but as a movie itself, Trash it!